Inzuki Designs was established in 2010 by Teta Isibo, combining her passions for design, style and everything Rwandan. 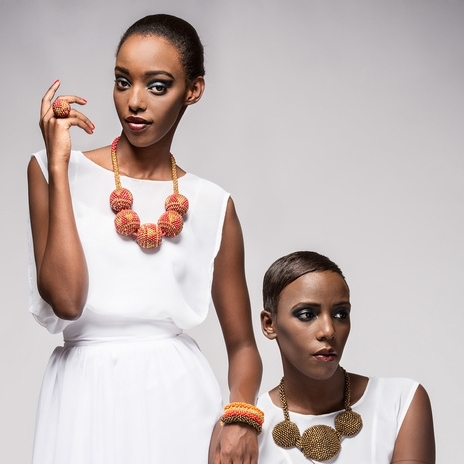 In partnership with local artisans, the brand creates vibrant, quality contemporary jewelry inspired by and incorporating traditional Rwandan craftsmanship and motifs. Pieces are crafted by means of intricate crochet beadwork; weaving techniques using sisal grass and embroidery thread; and carved cow horn, alongside a range of homewares and woven palm leaf bags. Based in Kigali City, Inzuki Designs has quickly become central to Rwandan cultural innovation and is well placed to direct the benefits back into local communities. Visit Inzuki's boutique in Kigali City (address below) or look out for the launch of their online store and stockists in the rest of Africa, Europe, Asia and North America. Inzuki is based in Rwanda and works with artisans in Rwanda.